I signed up for a 3 day workshop as soon as Deek Diedricksen put it up on the web, RelaxShacks.com. Waiting 3 months felt like forever! I was so obsessed with the tiny house movement that I forgot that Deek’s offer to sleep out in the “Gypsy Junker”, meant without heat. In November. Friday afternoon we all met and started the sub-flooring on Deek’s tiny one axle trailer. 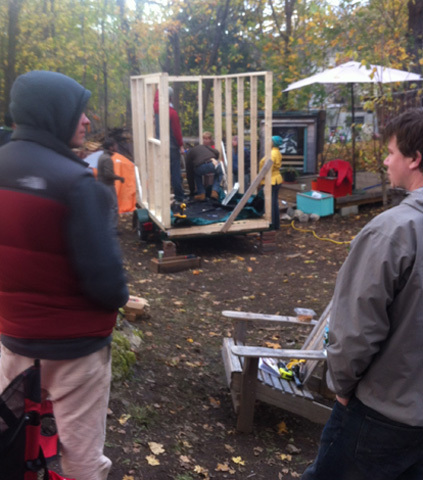 I learned all about vapor barriers, “great stuff”, foam and other insulations, bolting, bracing and closing the floor of a tiny house. 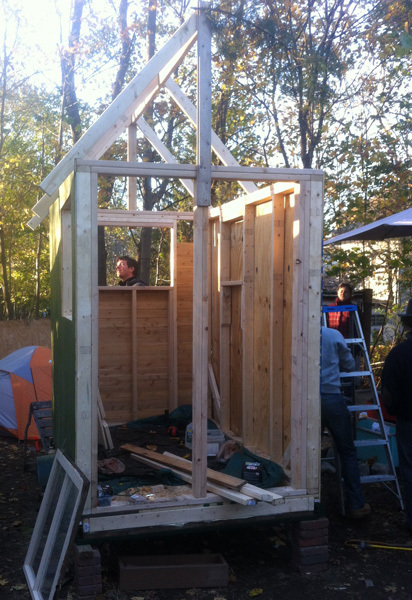 We framed the walls, made openings for windows did some sheathing with some recycled building products, windows from the side of the road and siding. 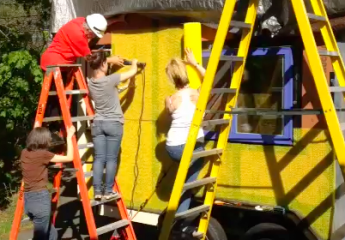 Building a tiny home on two axles is an item on my bucket list. Now I know how to construct it and make it a carbon neutral environment. I’ll let you know when it’s done! I’ve renovated my mountain homes, made them energy efficient; built out my commercial studios in mill buildings and yet, I’ve never had as much fun as I did with these creative “off the grid”, eco-warriors. We all came from different backgrounds, different states, and levels of experience, ages and cultures. 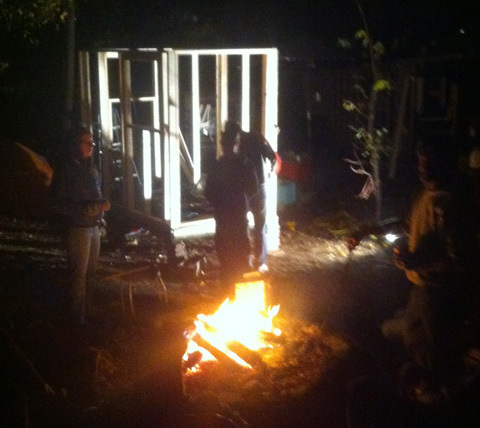 Tiny house advocates and the subculture that surrounds them make some pretty interesting campfire workshop parties! Our second evening campfire we were serenaded by banjoes, bongos, guitars, and the voices of passionate, driven, creative, artistic tiny house builders! 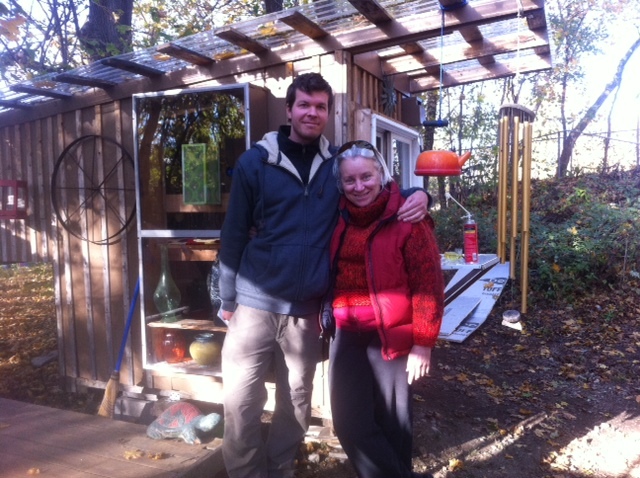 And a visiting tiny house bicyclist came by with a 350.org poster as his roof treatment! 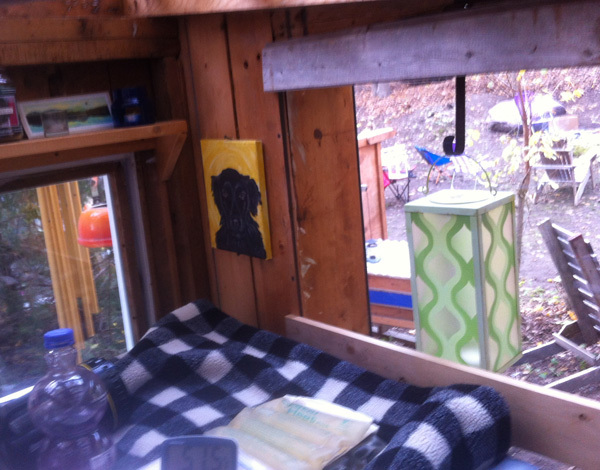 One of Deek’s early “Relaxshacks” called the Gypsy Junker (7 minute Youtube video), is all of 24 square feet! I slept in it for 2 nights, without using the heater, just to see if I could do it. Outside, 32°F, inside, 40°F. Glad I brought my Mummy Sleeping Bag and my crystal heat packs! 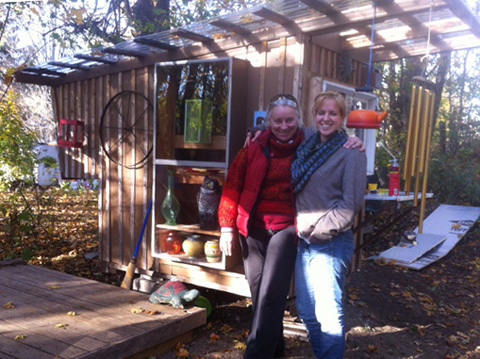 Thanks, Deek, for a great workshop and the opportunity to find a new group of sustainable friends! Thanks to Dustin, Steven, the Comet and Caravan builders! After Sandy ravaged our shores this week, I was once again reminded of how powerful nature is, how vulnerable we are and humanity’s denial of our impact on climate change and environmental resources. I’m in the red down jacket standing next to Deek. Steven Harrell from tinyhouselistings.com is standing behind me. http://www.thane.com/default/red-fusiontm-heat-wrap-basic.html The reusable Nikken Crystal Heat sodium acetate 6”x8” packs that kept me warm in the Gypsy Junker were 14 years old. They do not sell them anymore. However, these look great, I just ordered some. 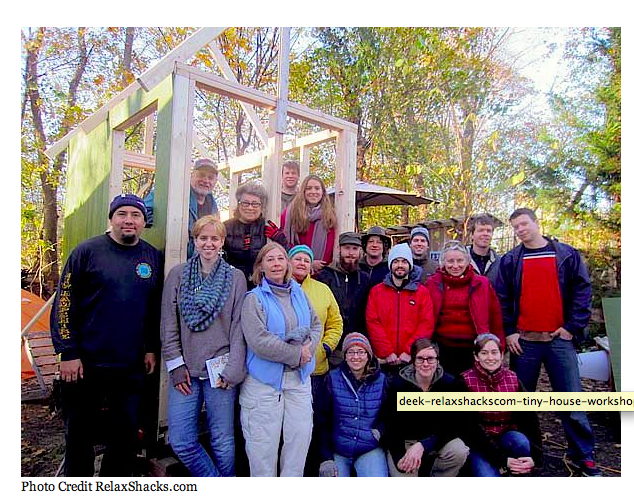 Tiny House Workshop of Deek’s that I took this weekend in Stoughton, Ma.